Louisille is the only school to have both women and men finish in the top five at the 2019 NCAA Championships. Pictured above is the record-breaking 800 freestyle relay team of Paulson, Albiero, Piszczorowicz and Harting. It’s already been an extremely successful year for Louisville in the pool, with women’s swimming and diving finishing a program-best fourth overall at the NCAAs. One week later, the men’s team had its say and capped a record-breaking season. Men’s swimming and diving placed fifth overall at the 2019 NCAA Championships, marking the highest finish in program history. Louisville previously logged its best-ever performance at the ACC Championships with second overall, then carried that momentum up to the national level. This year, Louisville is the only program to have both women’s and men’s teams finish in the top five. They are also the only school in ACC history to do the same. The Cardinal men combined for 212 points, seven All-American finishes and seven record-breaking finishes. Though lacking a national title effort like Mallory Comerford for the women, Louisville made up for it with team-wide excellence. 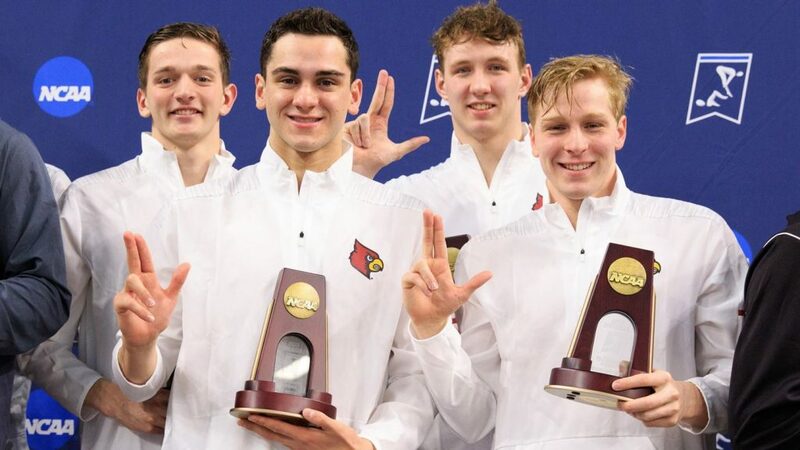 The Louisville men started out the NCAAs just like the women, with a record-breaking performance in the 800 free relay. Sophomore Nicolas Albiero, senior Zach Harting, freshman Bartosz Piszczorowicz and freshman Colton Paulson combined for a program-best sixth place in the race. Success in the relays continued on day two as Albiero, sophomore Evgenii Somov, Harting and junior Andrej Barna combined for fifth place in the 400 medley relay. Following that performance was Barna, sophomore Mihalis Deliyiannis, Albiero and freshman Tanner Cummings setting a school record with 10th place in the 200 free relay. After finishing ninth in the B final of the 100 fly, Albiero continued on with another superb individual showing. The sophomore placed sixth in the 100 back and earned All-American honors for the second straight year in the event. Somov followed Albiero’s suit and earned All-American honors for the second straight year in the 100 breast. The junior placed seventh in school record-breaking time. Harting posted Louisville’s highest finish in the 200 free since 2014, placing sixth and earning All-American honors. The team of freshman Mitchell Whyte, Somov, Harting and Barna capped an electric third day of racing with fifth place in the 200 medley relay. They earned the Cards’ fifth straight All-American honors in the event. Senior Marcelo Acosta closed out his collegiate career with sixth place in the 1650 free, earning All-American honors in the event for the second straight year. Albiero posted Louisville’s best finish of the NCAA Championships with fourth overall in the 200 fly in school record-breaking time. Albiero, Barna, Paulson and Harting finished up the NCAAs with sixth place in the 400 free relay.